As I type this, I am nursing my aching lower jaw with plenty of soothing tea. The reason? During Tropic Thunder, I didn't stop laughing, and my face is now paying the piper for that. It is, cards on the table, the funniest film I have seen in the last year, possibly the last two or three. It really was as good as I hoped it would be, but in a way which I wasn't expecting. The plot is well worn, being a cross between Platoon and ¡Three Amigos!, as a group of prima donna actors on the most expensive Vietnam war movie ever made, which goes three months behind schedule after four days of shooting, are dropped into a real life warzone by their director (Steve Coogan) on the advice of the no-handed veteran whose book inspired the film (Nick Nolte). They soon encounter a drug-manufacturing operation, and once they realise that the people shooting at them aren't extras, they have to fight for their lives. I've already said that Tropic Thunder surprised me, and this not merely because it's funny, but how it's funny. I was expecting something akin to Zoolander, Ben Stiller's last turn in front of and behind the camera, assuming it would be a 'stupid-clever' film in which very smart people act incredibly dumb, and there is something of that in the early part of the film, particularly with regards to Stiller's character, former world's biggest action star Tugg Speedman, a trailer for one of his action movies and repeated references to his ill-fated decision to star in the film 'Simple Jack'. However, this is only part of the film's humour and one that is quickly put into the background, as a much more interesting kind comes to the fore; satire. Tropic Thunder is not a spoof, as anyone who's had to endure any of the godawful Movie Movies that have been 'hilariously' sending up films over the last few years, but a genuine attempt to satirise Hollywood, its excesses and the egos and insecurities of its major stars, by people who are firmly ensconced in that system and can accurately pinpoint the pressure points and hit them hard. As such, it is quite blunt and uses broad caricatures to make its point, such as Robert Downey Jr.'s Method Actor, Kirk Lazarus, who never breaks character ''until the DVD commentary'', Jack Black's gross-out, fart-based comedian, Fats Portnoy (a love-child of Chris Farley and Eddie Murphy. Yeah, try to get that image out of your head) and the aforementioned Tugg Speedman, who Stiller plays as a walking bundle of neuroses who wants to be respected as an actor but whose first attempt backfired colossally. Another thing that surprised me about the film was how nice it looks. This is a seriously nice looking movie with high production values that match what you would expect from a real war movie, making it easy to see where the film's reported £100 million+ budget went. Stiller's direction is spot-on, perfectly mirroring that of real war movies such as Platoon, The Deer Hunter and, most obviously, Apocalypse Now and the action sequences that litter the film are really well-executed, and surprisingly gory, and the third act is genuinely quite exciting, without letting the laughs die down as a result. However, Stiller doesn't let this overshadow the important part of the film; the interplay between the characters, which is the source of most of the laughs. The film is really an ensemble piece and, even though Robert Downey Jr. really does steal the show as a man so method that he has dyed his skin black and acts like an African-American platoon sergeant for the entirety of the film, and whose monologue about going ''full retard'' is one of the best dissections of the Academy's obsession with actors playing the mentally handicapped is one of the high-lights of the film, everyone else gets their fair share of time. Jay Baruchel is left being the straight man to pretty much everyone else but is incredibly likable as the only vaguely normal person in the whole film, Brandon T. Jackson is great as the actual black member of the cast who constantly sparks with Lazarus over the way he maintains his character, and Jack Black is a whirlwind of profanity and twitchiness as a man who has spent too long away from his heroin. It really is a film that derives its humour from characters and plot, rather than just a wacky premise and the script by Stiller, Justin Theroux and Etan Cohen is really terrific. There's also another performance in there that mercilessly tears into the flabby hide of Hollywood executives and the alpha-male, ego-driven world of the men at the top of the studios. I won't say anything more about it, though, as it's one of those things that you really have to see to believe and it's best to go in knowing as little as possible about it. All I knew was a name and a role, and even then I think it was too much to make it a really big surprise, but not enough to deaden its impact. So the less you know, the better, but 'wow' is the only word for it. I've prattled on long enough so let's wrap up. 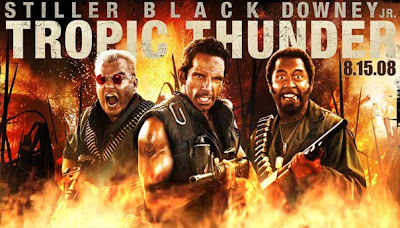 Tropic Thunder is the funniest film of the year so far (I don't think it'll be displaced but you never know) and is already in my Top 10 for the year. It's smart, funny, exciting and features two of the best comedy performances you'll see at a cinema this year. And if you don't like the main film, at least you get the joy of the Robert Downey Jr. fake trailer at the start.